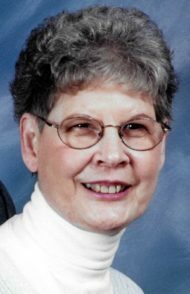 Ann M. Stief 84, of Lancaster, PA, passed away on February 7, 2019 at Lancaster General Hospital. Born in Lancaster, she was the daughter of the late Daniel M. and Anna Mary (Wagaman) Miller. Ann was the loving wife to Carl E. Stief. Ann graduated from Lancaster General Hospital School of Nursing in 1955. She retired from the Mennonite Home in 1999. She and her late husband enjoyed spending time traveling and serving her Lord within the S.O.W.E.R.S. (Servants, on Wheels, Ever Ready) ministry. Ann loved scrap-booking and working on albums of their travels. She was a member of Calvary Church. Ann is survived by a son, Brad Stief of Lancaster. She was preceded in death by a brother, Daniel W. Miller. Brad, I just learned about your mother’s passing. I know you will miss her and yet we are comforted to know she is with the Lord. I would love to see you again but I have not been back to PA in some years now. If you ever get to South Carolina you are welcome here. If your mother had an address book, mine is the same as since 1988 but I do plan to move sometime this year. I am so very sorry to hear of Ann’s death. We were good friends in nurses training and after. We played cards with Ann and Carl. May God comfort you in her loss. We extend our deepest sympathy to you. We will always recall your mother as the model for graciousness. It was great working with Ann and knowing her for the 10 years that I worked at Mennonite Home. Also kept in tough with her these past few years. She was a great woman. Visited her last year while at the Rehab. Hospital. Often saw her at Oregon Dailry Resturant. My thoughts and prayers are with you at this time Brad. Brad I am so sorry to hear about Ann’s passing. Have great memories of both your mother and father. Laughing in your living room being the highlight. Be strong and know that she is in a better place. Love you, John and Carol. Brad, so sorry for the loss of your mother.